Opal rings are among my personal favorites! I love the way each one is so unique. Even with the same setting, the stone itself will make each one look completely different. The majority of the rings here features natural opals, although you will also find some with created gems which keeps the price down. Those are clearly labeled in this article. This page showcases a beautiful collection of rings that any woman would love to own. I hope you enjoy browsing these lovely selections which would make wonderful cocktail, engagement, party and even everyday wear rings. They truly are perfect for any occasion. Here are three different styles and settings, but each ring features a genuine opal in the center. Everything about the settings of these rings is about accenting and accentuating the beauty of the main single center gem. The fiery effect of the opal is allowed to be central focus in every way. Even the diamonds do not detract from the fiery opal. 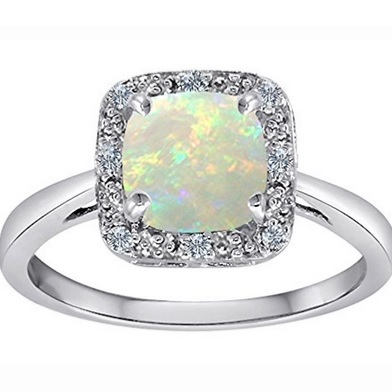 Many of you may already know that the opal is the birthstone for October. 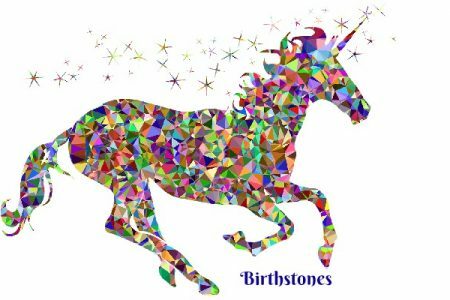 Plus, you have probably heard several superstitious beliefs about opals, but here are a few fun facts that you may not have ever heard before. In 250 B.C. the Roman emperor Constantine had an opal set in his crown to depict his authority and protect him against danger. The opal is said to be the talisman of thieves who believed it made them invisible. It was Scottish author Sir Walter Scott who first claimed (falsely) that opals are unlucky when he wrote them into a novel. Opals are the perfect gift for 18th wedding anniversaries. In health the opal is associated with the blood and the kidneys. Opals boost self confidence and self esteem. The opal is said to protect against danger. Opals were popularly used by shaman and healers. This is a gorgeous opal ring featuring a large, single natural opal, set in 14 kt. yellow gold and surrounded by diamonds. The antique style is very elegant and will appeal to everyone. Keep in mind that each opal is unique so that alone will set this ring apart as a precious jewel, but the setting on this particular ring is quite spectacular. Many of us prefer a ring that is not a commonly used setting and has that “one of a kind” appearance. This is not a ring you are likely to see on any other woman, unless you lend it to them. Owning a genuine opal does not have to be expensive to be exquisite. This ring features a single white opal surrounded by a Marcasite setting of black enamel and sterling silver which makes it an even more intriguing ring. This stone may not have the same fiery effect of the previously shown opals, but sometimes the basic black and white is exactly what we desire. It is imperative that you properly care of an opal. One thing you need to know is that natural opals can dry out. It is essential to treat them regularly with mineral oil. That will help preserve the gem. To treat them, you simply rub mineral oil on them with a cotton swab or your finger and allow them to drink in the needed nutrition. Be sure to treat the back of the stone as well if the setting will allow for it. One final note about preservation, you may be tempted to soak them in the oil to avoid touching it yourself. However, never soak or store the gems in the mineral oil. There are definitely times when we desire the fiery look of a genuine opal without the expense. Some of the simulated opals are gorgeous and often no one can tell the difference. Lab created opals are also offered in a wide range of settings, so frequently you simply prefer the overall look of the piece. Here are a few lab created opal rings that you might want to consider if you desire the beauty of an opal, but not the cost. The stones for each ring are unique, especially in the genuine opals. Please remember, there will be slight differences in the opal you receive to the rings shown in the photos, but every opal is a rare and beautiful treasure.